May 2nd: Cthulhu Mythos Books Campaign – Up to Six New Titles from Dark Regions Press! On May 2nd 2017 Dark Regions Press will be launching a new Kickstarter campaign to create a Cthulhu Mythos anthology featuring cover artwork by renowned artist Richard Luong (Cthulhu Wars, Tentacles and Teeth) as well as support the creation of five new Dark Regions Press titles! Five new titles will be available for preorder in ebook, trade paperback and/or deluxe limited edition formats, and if the campaign reaches its goal a new Cthulhu Mythos anthology featuring cover artwork by Richard Luong (http://luongart.hostoi.com) will be created and distributed free to campaign backers (who will also be immortalized in the Thank You pages of the book!). New Dark Regions Press titles to be offered in the May 2nd 2017 campaign will be revealed here throughout March and April leading up to the campaign launch date, so make sure to check back regularly! The Red Brain: Great Tales of the Cthulhu Mythos Edited by S. T. Joshi, a follow-up anthology to A Mountain Walked. The book will be available in ebook, trade paperback and a deluxe slipcased edition designed to match the slipcased collector’s edition of A Mountain Walked so that both volumes line up nicely on the shelf. Featuring stories from Ramsey Campbell, Thomas Ligotti, Caitlín R. Kiernan, W. H. Pugmire, Mark Samuels, Ray Garton, Clark Ashton Smith and more, The Red Brain will be offered for preorder on Tuesday, May 2nd 2017 in our upcoming Cthulhu Mythos campaign! The new weird fiction novel The Boke of the Divill by Reggie Oliver will be available for preorder for the first time in our upcoming May 2nd 2017 Cthulhu Mythos Books campaign in both ebook and trade paperback formats! For more than thirty years, Michael Shea has been making his own distinctive contributions to the Cthulhu Mythos devised by H. P. Lovecraft—an entire universe of gods and monsters that hundreds of writers have imitated. 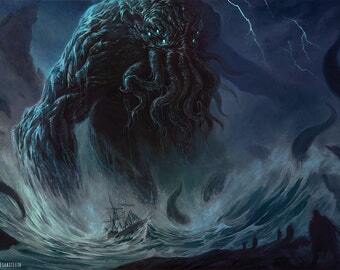 But Shea has done a lot more than merely mimic Lovecraft’s prose or add a new god or “forbidden book” to the Mythos. In his Mythos tales, Shea has infused his own unique vision and perspective. The much-reprinted “Fat Face” takes us into the seedy underworld of prostitutes and drug dealers in San Francisco, while other tales such as “Dagoniad,” “Copping Squid,” and “Tsathoggua” vividly meld Lovecraftian cosmic horror with the contemporary world of California, with its swimming pools and beachcombers. Shea was also fascinated with Lovecraft’s novel of Antarctic horror, At the Mountains of Madness, and his stories “Under the Shelf” and “Beneath the Beardmore” take us to that frozen land of death and terror. The title story, “Demiurge,” is a previously unpublished novella that draws upon Lovecraft’s tales of psychic possession in its chilling portrayal of a nameless monster who may be the harbinger of the overthrow of the entire human race. Michael Shea (1946–2014) was the award-winning author of The Color out of Time, the Nifft the Lean series of fantasy novels, and the classic tales “Polyphemus” and “The Autopsy.” This volume of his complete Cthulhu Mythos tales has been assembled by S. T. Joshi, a leading authority on Lovecraft and the Mythos. In 1975, young Bill Simmons is the new kid in New Milford. Bullied and struggling for acceptance, he meets four other boys who form the ‘the Cemetery League’, a group devoted to the weird, exotic and bizarre in movies, comics and television. Each boy carries their own secrets which combine to come to a violent and fiery conclusion in a lonely Connecticut forest. Now, nearly forty years later, the events of that night come back to haunt Bill Simmons as, one by one, the members of the Cemetery League are targeted by an unknown force that may have unnatural links to their past. Has something, or someone, come to exact a bloody vengeance? And how is it linked to a serial killer’s twenty year spree throughout the Nutmeg State? To answer these questions, Bill Simmons will have to face his greatest fears and the failure that destroyed his life and left him a hopeless alcoholic. But will it be enough? This epic new Cthulhu Mythos anthology with cover artwork by Richard Luong will be unlocked if our Cthulhu Mythos Books campaign reaches its funding goal before its deadline! Campaign backers will get to vote on three concepts for the cover art and will all be immortalized in the Thank You pages in the back of every copy of the book ever printed. Cthulhu Fhtagn! Join us on May 2nd 2017 to Support the Creation of Five New Dark Regions Press Titles and Contribute to Creating a Sixth on Kickstarter.com!